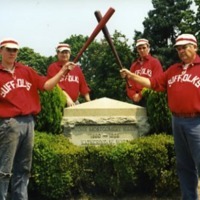 A photograph of the Huntington Suffolks vintage baseball team standing over the grave of John Montgomery Ward and Katherine W. Ward at the Greenfield Cemetery in Uniondale, N.Y., in section 2, lot 185, grave 2. Two members of the team are holding baseball bats in the air criss-crossing each other. 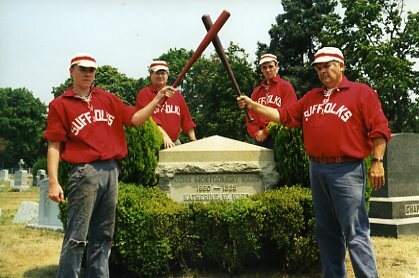 Harrison, Robert L.	, “Huntington Suffolks baseball team,” Hofstra University Library Special Collections: Digital Collections, accessed April 23, 2019, https://omeka.hofstra.edu/items/show/697.